At the age of fourteen, Kiron Mukherjee got his first job at the Royal Ontario Museum (ROM). Ten years and 12 different positions later, he’s still there, coordinating the museum’s family and children’s programming. He has a keen interest in emerging technologies, promotional marketing and providing engaging and educational children’s programming with equitable access for all. … and he still can’t get enough of the dinosaurs. I studied at York University in Toronto where I graduated with a degree in history. The best education I ever received though, came through being a ROM camper and then working at the ROM since I was 14. Growing up in the museum has allowed what I do to feel second nature – what I do really just feels like an extension of who I am. My first moment was a sobering, but still inspirational one. Long story short, I wanted to be a paleontologist since my first visit to the ROM as a kid. In Grade 8, however, my mom sat me down with the course calendar and admission requirements for paleontology programs and told me I had to learn calculus. I’m THE WORST at math, so my dreams vanished pretty immediately. Happily, I was attending the ROM’s Summer Club at that point, and I realized there that I’d really like to get into teaching. From there, my volunteer and work experiences at the ROM began. My second big moment was about 4 years ago. I had a gig at a wonderful little art school in Toronto that involved teaching pottery and painting techniques to children roughly aged 5 to 8. My responsibilities at the ROM had been steadily increasing to the point where I had to decrease my commitment to the art school, and because the kids knew I was ALWAYS at the ROM when I was away, they would call me “KiROM.” I think, at that moment, I knew I needed to wholeheartedly focus my work to the place I had already subconsciously chosen was for me. My blog is called ROMKids, which is the department I work with. I think ROMKids contains EVERYTHING that is great about a museum: the staff, the galleries, the research, the programs… naming the blog ROMKids just felt appropriate. It’ll be turning 2 this October! ROMKids had been on Twitter (mostly just lurking) for about two years by the time I really took the social media over and went for it. At that point I wasn’t sold on how I could use Twitter to extend our reach since I don’t really like to advertise in the traditional sense – I don’t like ads, and I know that for the most part, the rest of the world doesn’t like them either. However, as I became more comfortable with Twitter, I realized people actually cared about the stuff we did at the ROM. When I started sharing what we were up to, people responded really positively and wanted to get more involved with our programs. Because I work closely with so many ROM departments, I find I get a really cool view of what the Museum is and how it works. And, working with kids is just about the best thing in the world. I realized that when you put the two together you get something that everybody loves, something that really resonates with people. People love the “Behind the Scenes” posts – they love seeing what a #ROMSleepover looks like, they love seeing what artifact I’m borrowing next for an upcoming Family Weekend, or even where I’m buying the camp’s plaster from. So, I learned that we actually have a lot of really cool content to talk about. It was then I decided for us to get on Tumblr. The blog provided me with a place to host the day-to-day life of the museum and go more in-depth than the 140 characters allowed on Twitter. I think blogging is wonderful because it allows you to very casually invite people into your world and show them what you’re up to. Literally two minutes ago I brought a toddler and her mom up to their Tiny Tots group in our Egypt Gallery. But the last exhibit I spent time exploring was our Ultimate Dinosaurs: Giants of Gondwana exhibit. It had everything I ever wanted in a dinosaur show. I do and I think it’s awesome. It’s fun and it’s a great way to meet people and learn. It’s also good if you’re trying to extend the reach of your brand. With Twitter, and blogging, really, I just try to be real and show the cool things we’re up to in our everyday life at the museum. What’s not to love? Like, wouldn’t you want to go up to one of the mummies and have a causal conversation about his/her life? Or chill with a dinosaur? And, you know, the Huns are always good for a laugh. I enjoy the book more, though. We like to read the story to our 5 year-olds in the galleries. The kids then go up to our guards and ask them what they saw last night. The guards are great – they’ll give the kids a good story. The biggest opportunity for museums today is teenagers, but not in the way museums may think. Rather than trying frantically to elicit visits from teenagers right now, we need to be more future-oriented in our approach. Being real, museums are a hard sell to teens in the traditional sense. Teens are busy; they have homework, school, extracurriculars, and personal lives – so lots going on. It wasn’t too long ago that I was there, and I remember it all. It’s unlikely that teens are going to claim a museum as their new weekly hangout spot, like movie theatres and malls (for example). In my view, the way to get teens into your museum is through job opportunities – both volunteer and paid. Teens need their community service hours to graduate high school (at least in Toronto), and they need money. Mostly, they need experience to put on their resumes. On that note, museums need volunteers to run gallery programs for kids, to give tours, or to hand out maps. Some of the greatest experiences I had as a kid at the ROM were when a museum volunteer would talk to me about an object or show me how to write in Egyptian hieroglyphs. Museums need help, and teenagers are the perfect fit. Teens are enthusiastic, energetic, and eager to learn. By recruiting teenaged volunteers, you’ll develop future staff who know your organization, and when summer or part time jobs arise, you’ll already have well-trained volunteers to hire from – people who already know how to get around your building, and who understand your policies. But the GREATEST thing about teens in museums is that, if you do it right, they’ll build wonderful memories, make friends, and really fall in love with your institution. THEN when they grow up and have a family, they’ll already have a fondness for your institution and bring their kids to your museum. Perhaps they’ll even get a membership. Then, those kids will grow up at the museum, volunteer when they’re teens, and the cycle it continues. It’s the Museum Circle Of Life. Museums are incredibly hard to find steady work in. However, if you are persistent enough and are willing to put in the hours (specifically the volunteer hours), positions will eventually open up. Gain as many different experiences as you can and network, network, network. The people you know, backed with your expanding experience, will pay off somewhere. 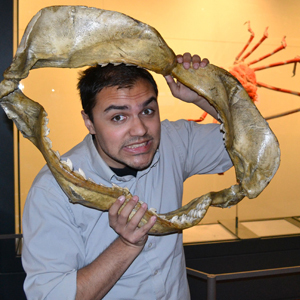 Thanks for participating in Meet a Museum Blogger, Kiron (or should I say KiROM?)! I must say, I LOVE Kiron’s ‘Museum Circle Of Life’ – you should patent that, friend! I agree – teenagers are a fantastic audience for museums to engage with outside of the realm of education. That’s not an attack on museum education departments at all, but teenagers are looking for more. More than a tour, more than a lesson plan – they want responsibility and to be a part of the activity, hustle and bustle. Given the opportunity they could become some of our biggest advocates not only in their own homes, but in their communities. What do you think? In case you missed it, Kiron blogs at ROMKids. Do you have any additional questions for Kiron regarding his profile above? Feel free to start a conversation in the comments below or reach out to him directly on Twitter. His Twitter handle is @kironcmukherjee. I highly encourage you to use the #MuseumBlogger hashtag. TY! Tags: Kiron Mukherjee, Night at the Museum, ROMKids, Royal Ontario Museum, Tumblr, Twitter, Ultimate Dinosaurs: Giants of Gondwana, York University. Bookmark the permalink.